Canadian mountain lakes with clear blue water are wonderful in their cold, harsh beauty, and numerous posters have spread this beauty around the world. When it comes to the lakes of North America , immediately there is an association with the Great Lakes, but apart from them there are thousands of others that you should visit at least once in your life. 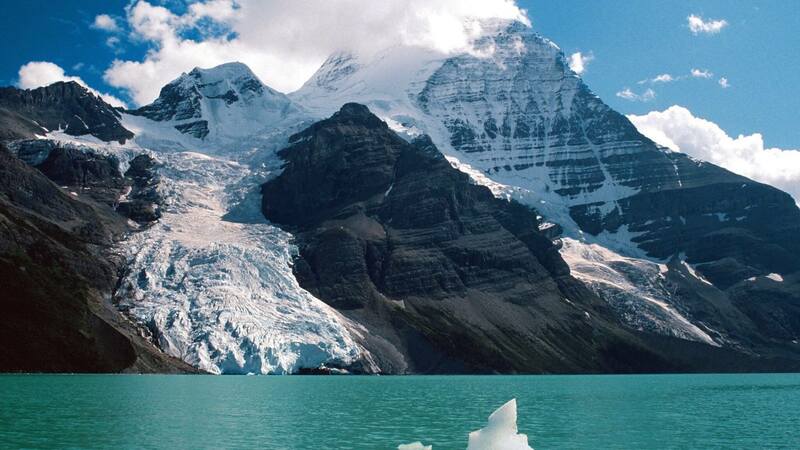 Lake Berg, located in British Columbia, is one of the coldest lakes. Even in the summer, there are icebergs. It is spread among wild, almost untouched nature, surrounded by Rocky Mountains, waterfalls, canyons and glaciers. Lake Garibaldi is located near Vancouver. It is a favorite holiday destination for tourists and locals, due to its convenient location, azure water and beautiful surroundings. In winter and summer it gives the chance to enjoy it: in the summer period with kayaks and canoes and in the winter with appropriate seasonal sports. Lake Kootenay is located in all the same British Columbia, among the Rockies. This lake is notable for its size and interesting feature - many rivers flow into it, but only one follows - Kootenay (like the Russian Angara, "leaving" Baikal). Lake Louise is located in the Banff Nature Reserve. This is the most beautiful Canadian lake - it is surrounded by mountains with snow-capped peaks that shine in the sun. The water has a bright saturated color, which gave birth to the lakes second name - Emerald. Since its length is two and a half kilometers, then it is good to travel by canoe. In the winter, the smooth surface of the lake turns into a good ice rink, which attracts fans of speed skating. In the province of Alberta in the Jasper National Park, Lake Malain is located. The mountains surrounding it consist of the oldest rocks, formed 500 million years ago. In the province of Quebec, there is a lake in which locals constantly "see" a monster like Loch Ness. They call him Mempr and tell amazing legends connected with this monster and the lake itself. This lake is called Memphremogog, which means "Great water space". It is surrounded by a very diverse landscape, which consists of the Rocky Mountains, hills and plains. Moiraine is the most recognizable and visited lake in Canada. The bright blue color of the water, in which, as in a mirror, snow-covered mountain peaks are reflected, creates an atmosphere of unearthly beauty and tranquility. Lake Nipissing is famous for the diversity of the underwater world, for which its waters are created by the most favorable conditions. Lake Ontario speaks for itself. It is known all over the world thanks to books and films. It is so beautiful and cozy that locals spend all weekend there doing fishing, surfing and water skiing. And in the winter it is widely used by the amateur anglers and athletes. The mountain lake Waterton occupies a special place among the Canadian lakes due to the changing color of water, a variety of coastal landscapes, which include steppes, alpine meadows, tundra, Rocky Mountains and even freshwater swamps. It belongs simultaneously to Canada and the USA, as their borders pass through this lake. You can travel on it both on boats and on old-fashioned ships, where guides will tell not only the history of the area, but also dilute their story with local romantic and heroic legends.